The first time journalist Jon Lurie meets José Perez, the smart, angry, fifteen-year-old Lakota-Puerto Rican draws blood. Five years later, both men are floundering. Lurie, now in his thirties, is newly divorced, depressed, and self-medicating. José is embedded in a haze of women and street feuds. Both lack a meaningful connection to their cultural roots: Lurie feels an absence of identity as the son of a Holocaust survivor who is reluctant to talk about her experience, and for José, communal history has been obliterated by centuries of oppression. Then Lurie hits upon a plan to save them. 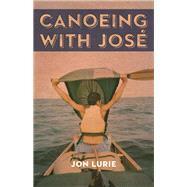 After years of admiring the journey described in Eric Arnold Sevareid’s 1935 classic account, Canoeing with the Cree, Lurie invites José to join him in retracing Sevareid’s route and embarking on a mythic two thousand-mile paddle from Breckenridge, Minnesota, to the Hudson Bay. Faced with plagues of mosquitoes, extreme weather, suspicious law enforcement officers, tricky border crossings, and José’s preference for Kanye West over the great outdoors, the journey becomes an odyssey of self-discovery. Acknowledging the erased native histories that Sevareid’s prejudicial account could not perceive, and written in gritty, honest prose, Canoeing with José is a remarkable journey. Jon Lurie has worked as a camp counselor, as a teen adviser at a Native American youth center, and as an editor at the Anchorage Daily News and The Rake. His journalism has been published in a wide range of publications, including Metro magazine. A graduate of the MFA program in Creative Writing at the University of Minnesota, Lurie teaches creative writing at Macalester College and the University of Minnesota. He serves as director of the Mother of Waters Project, a cultural outreach program that combines experiential learning with arts education, focusing on the health of Minnesota’s fresh water resources. He lives in St. Paul, MN.